Abstraction – Minimize hard dependencies between systems. Event-driven programming – Eliminate polling patterns for more scalable and high performing software. Cleaner application code – Safely dispatch messages without concern for what is handling them or whether they are being handled at all. Concurrency – Queue events from various threads for safe execution on another thread or for distributed system applications. Predictability – Provide support for ordering of handlers on a given bus. Debugging – Intercept messages for reporting, profiling, and introspection purposes. The EBus source code can found in the Lumberyard directory location <root>\dev\Code\Framework\AZCore\AZCore\EBus\EBus.h. You can configure EBuses for various usage patterns. This section presents common configurations and their applications. The simplest configuration is a many-to-one (or zero) communication bus, much like a singleton pattern. There is at most one handler, to which any sender can dispatch events. Senders need not manually check and de-reference pointers. If no handler is connected to the bus, the event is simply ignored. // One handler is supported. // The EBus uses a single address. Another common configuration is one in which many handlers can be present. You can use this configuration to implement observer patterns, subscriptions to system events, or general-purpose broadcasting. Events to the handlers can be received in defined or undefined order. You specify which one in the HandlerPolicy trait. // Multiple handlers. Events received in undefined order. // Multiple handlers. Events received in defined order. EBuses also support addressing based on a custom ID. Events addressed to an ID are received by handlers connected to that ID. If an event is broadcast without an ID, it is received by handlers at all addresses. A common use for this approach is for communication among the components of a single entity, or between components of a separate but related entity. In this case the entity ID is the address. In the following example, messages broadcast with an ID arrive at each address in no particular order. // One handler per address is supported. // The EBus has multiple addresses. Addresses are not ordered. // Messages are addressed by EntityId. 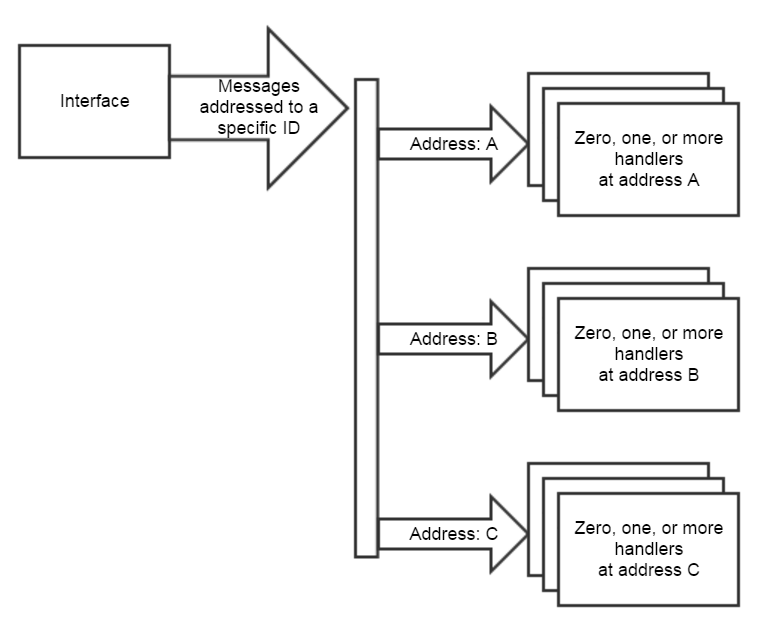 In the following example, messages broadcast with an ID arrive at each address in a specified order. // The EBus has multiple addresses. Addresses are ordered. // Addresses are ordered by EntityId. // Allow any number of handlers per address. In the following example, messages broadcast with an ID arrive at each address in a specified order. At each address, the order in which handlers receive the message is defined by the EBusHandlerPolicy, which in this example is ByIdAndOrdered. // We address the bus EntityId. 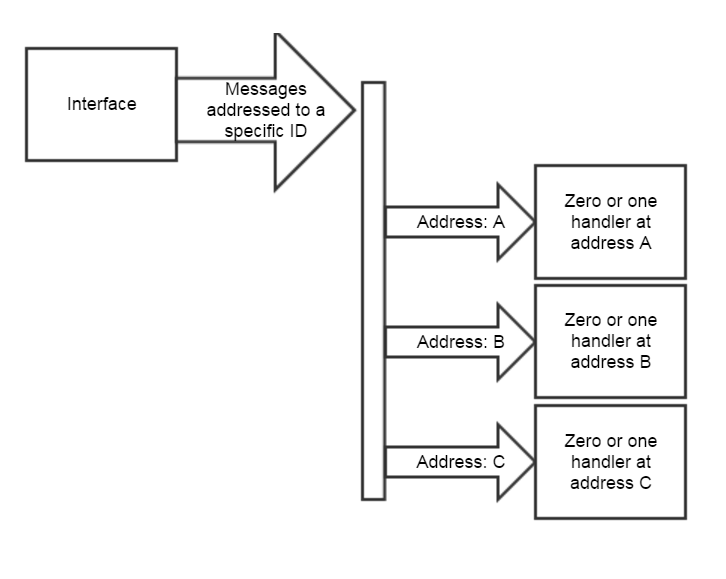 EBus supports both synchronous and asynchronous (queued) messaging. They don't require storing a closure. Arguments are forwarded directly to callers. They let you retrieve an immediate result from a handler (event return value). They create many more opportunities for parallelism and are more future proof. They support queuing messages from any thread, dispatching them on a safe thread (like the main thread, or any thread that you choose). The code used to write them is inherently tolerant to latency and is easily migrated to actor models and other distributed systems. The performance of the code that initiates events doesn't rely on the efficiency of the code that handles the events. In performance-critical code, asynchronous messages can improve i-cache and d-cache performance because they require fewer virtual function calls. For information on declaring an EBus for queing and sending messages asynchronously, see Asynchronous/Queued Buses. Cache a pointer to which messages can be dispatched – This is handy for EBuses that have IDs. Instead of looking up the EBus address by ID for each event, you can use the cached pointer for faster dispatching. Queue any callable function on an EBus – When you use queued messaging, you can queue a Lambda function or bound function against an EBus for execution on another thread. This is useful for general purpose thread-safe queuing.